This is one of my favorite summer salads, and this time of year, I could seriously eat it EVERY day! Another reason it’s a favorite is because only takes about 15 minutes to prepare. I use different types of tomatoes, depending on what’s available at the farmers market. This salad is especially tasty with heirloom tomatoes. 4 cups of chopped cucumbers. I prefer English or Japanese varieties. 3 cups of chopped tomatoes. Any type of tomato works, cherry, plum, grape, heirloom, etc. 1/2 cup of olive or avocado oil. I like this brand of avocado oil. 3-4 Tbsp of lemon juice. The amount depends on how much of a “lemony” taste you want! 1 1/2 Tbsp of sumac. 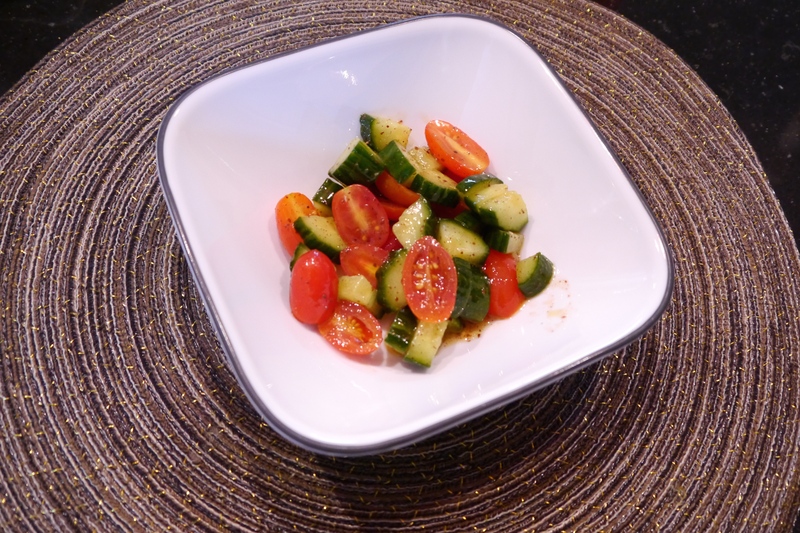 Add chopped cucumbers, tomatoes, and avocados to a large bowl. Add oil, lemon juice, sumac, and parsley. Mix gently until ingredients are well incorporated. It can be served immediately, or 15-30 minutes after prepared. Categories: Dairy Free Recipes, Egg Free Recipes, Gluten Free, Nut Free Recipes, Recipes, Side Dishes, Vegetables | Tags: Avocado, Cherry tomatoes, Cucumbers, Heirloom tomatoes, Plum tomatoes, Salad, Salad Recipes, Sumac, Summer, Tomatoes | Permalink. Yum! And what is Sumac? What type of flavor does it have?? Sumac has a mild, tart flavor. You’ve probably tasted it before if you’ve ever had kebabs at a Greek or Middle Eastern restaurant.